"We are unable to validate this serial number for <product name>. Please contact Customer Support." 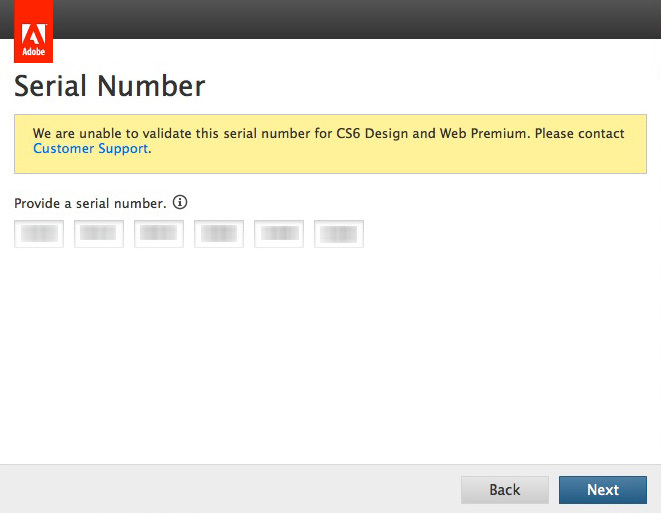 Creative Cloud does not use serial numbers, instead users sign in with their Adobe ID. Retail DVD: The serial number is on the back of your DVD case. Retail electronic download: The serial number is in the email receipt from the Adobe Store. The Adobe Store sends the receipt to the email address you used as your Adobe ID when you purchased the product. Retail customers can obtain their serial key through their Adobe.com account as well. During all Online Store download orders, the serial number is automatically registered to your account. Registered serial numbers: If you have registered your serial number with an Adobe ID, this serial number is in your Adobe.com account under the Adobe ID. Important: When you buy software through Adobe volume licensing, it's necessary to download it from the Licensing Website (LWS). You can also install the software using the CD or DVD that came with your volume licensing order. If your serial number doesn't work, you could be trying to use it to activate a retail or trial version of the product. Retailer/Reseller (OEM): The original equipment manufacturer provides the serial number. OEM products are bundled with hardware or other software. (For example, you can sometimes buy a computer with an Adobe product already installed.) Contact the company that bundled the product. 2. Re-enter the serial number of the Creative Suite product that you are installing. The title bar displays the name of the product being installed. The following information can help you enter the serial number correctly. The installer is product-specific. A separate installer has been created for each Adobe Creative Suite product. For example, you cannot enter your Photoshop serial number to install another product in the suite. Serial numbers are numeric. Do not enter alphabetic characters. 3. (Launch) Reinstall the product with the serial number. The product installer allows you to install as a trial or as a serialized product. If you are installing a trial version, specify the installation language when installing. If your serial number is for a different language set than the installation language, you get this error message. The following language-specific software installs two language packs. Each line represents a new language group. You can serialize from either language in the pack. You don't get an invalid serial number error if you install in one language and serialize in the next. Reinstall the product and enter the serial number when prompted.